Basuki “Ahok” Tjahaja Purnama on Thursday was released after serving nearly two years for blasphemy, with netizens welcoming the former Jakarta governor with creative memes and jokes online. Numerous uploads on various social media platforms, including Twitter and Instagram, have users sharing their illustrations on Ahok, who has asked to be referred to as BTP following his release. To mark the moment, netizens created memes of him and shared jokes that enlivened conversations popularly discussed on social media. 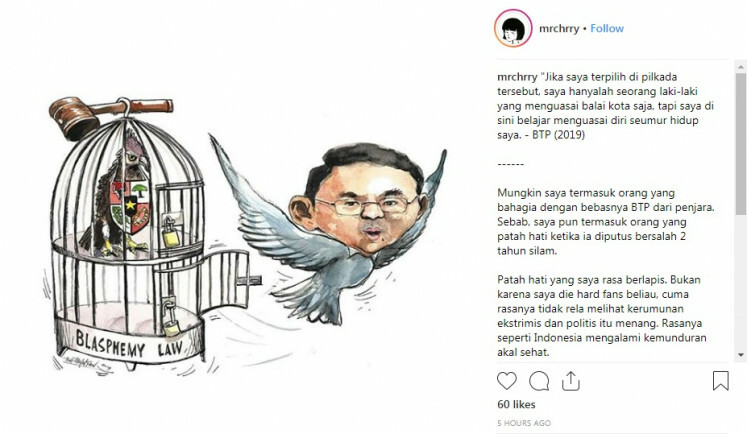 Instagram user @mrchrry uploaded an image that showed Ahok's head plastered on the body of a bird flying out of a birdcage that had the words "Blasphemy Law" written on the bottom. The cage also features a court hammer on top and another bird with the symbol of the state ideology Pancasila, as the bird is still locked inside a separated top half part of the cage. Twitter user Non Kafir with account @yudhinulis posted a meme of Ahok with a confused face and a text that says "Why is my The Sims like this", referring to the life simulation video game. The post is captioned "BTP's first response when he comes home #BTPPulang". Twitter account @WiraDamarr posted a cartoon of Ahok packing a suitcase and the words "Let's go home". The post is captioned with a quote "It is not easy to dim your light. You have never gone out." Handoko Tjung on Twitter shared a lighthearted joke in a post, illustrating the moment by referring to several popular songs by local and international singers. 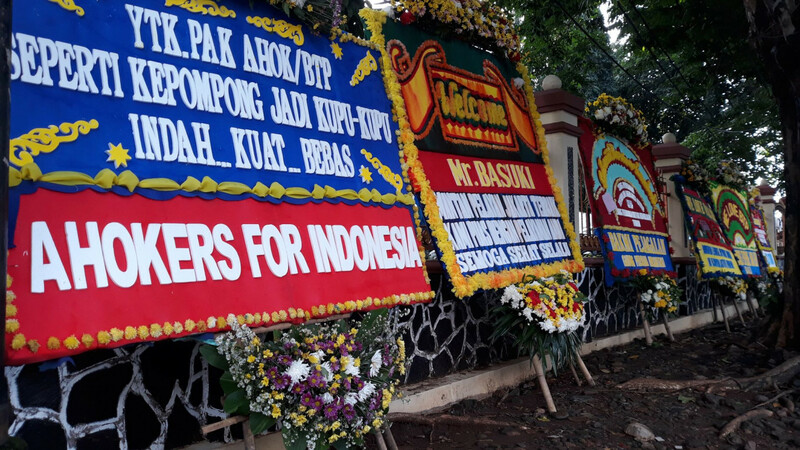 "Ahok comes out from Mako [Brimob], hugging his wardens first while using background music Vitamin C "Graduation", Sheila on 7 "[Classical] Stories for the Future" and Project Pop "Remember Today"," Handoko wrote, adding the hashtag #AhokBebas. Adi Ekaputra on his Twitter account @ekapen also shared a joke, playing on Ahok's new preferred name to be called by "BTP" and popular K-pop boyband "BTS".